Micranthocereus hofackerianus in flower in habitat. Photo: Marlon Machado. Ingo Horst is the son of Leopoldo Horst, the cactus explorer that discovered numerous new species in Brazil during the nineteen sixties and seventies through the early eighties. 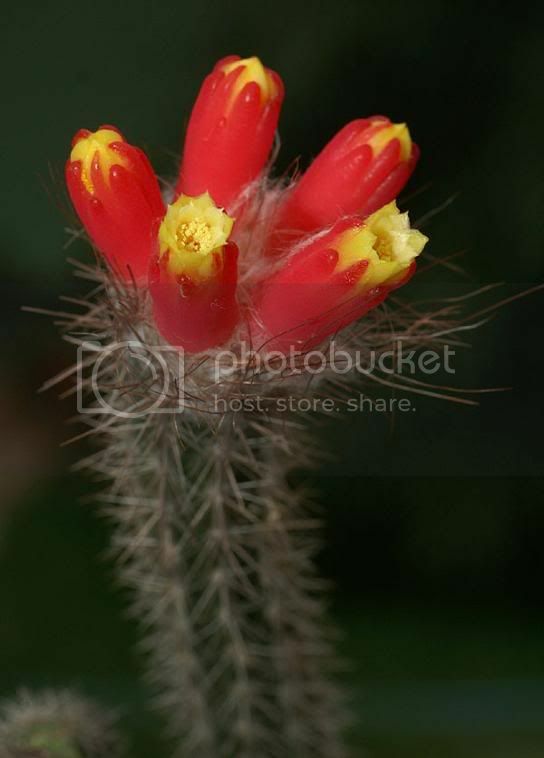 These species were described by the cactus authorities of the time, like Ritter and Buining, and many of these new plants were named after Horst, for example the exquisite Discocactus horstii. Leopoldo Horst's field collection numbers are the well-known HU numbers, the acronym standing for Horst & Uebelmann, the latter being Werner Uebelmann, a Swiss nurseryman with which Horst had a exclusivity contract to export his cactus discoveries. Uebelmann financed many of Leopoldo Horst's field trips, and accompanied him on a number of occasions. Uebelmann was responsible for the introduction to cultivation in Europe of basically all of Horst's discoveries, and he is also celebrated in a number of these new plants, with even a genus of true gems named after him: Uebelmannia - I cannot think of better honor. The little town of Piat?. Photo: Marlon Machado. 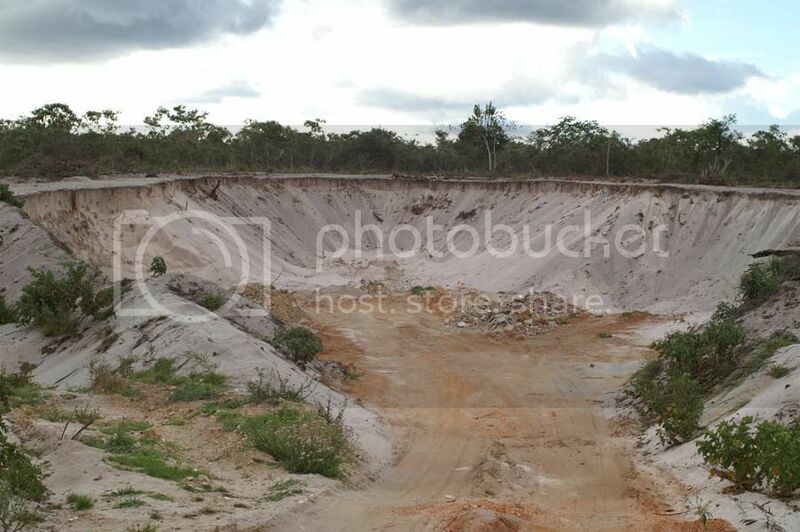 Sand quarry at the habitat of Micranthocereus hofackerianus. Photo: Marlon Machado. 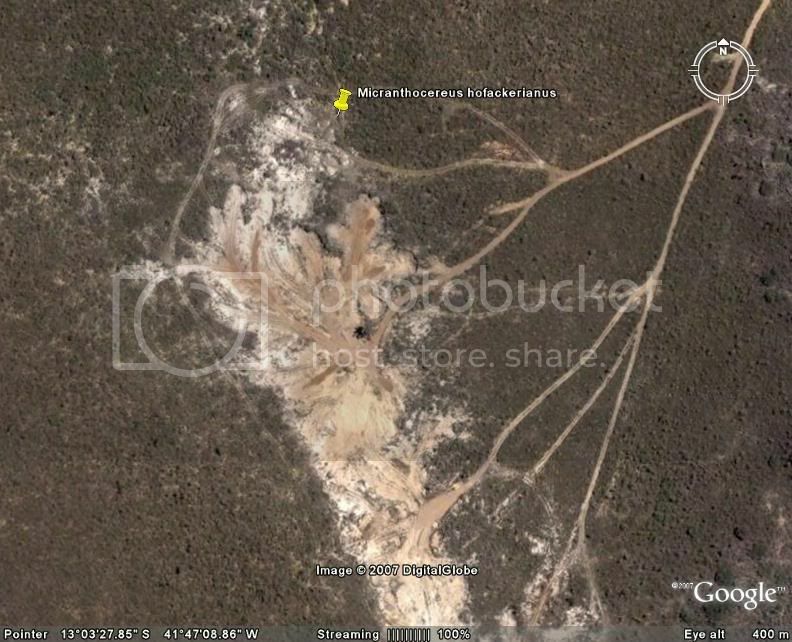 Aerial view of the sand quarry at the habitat of Micranthocereus hofackerianus. 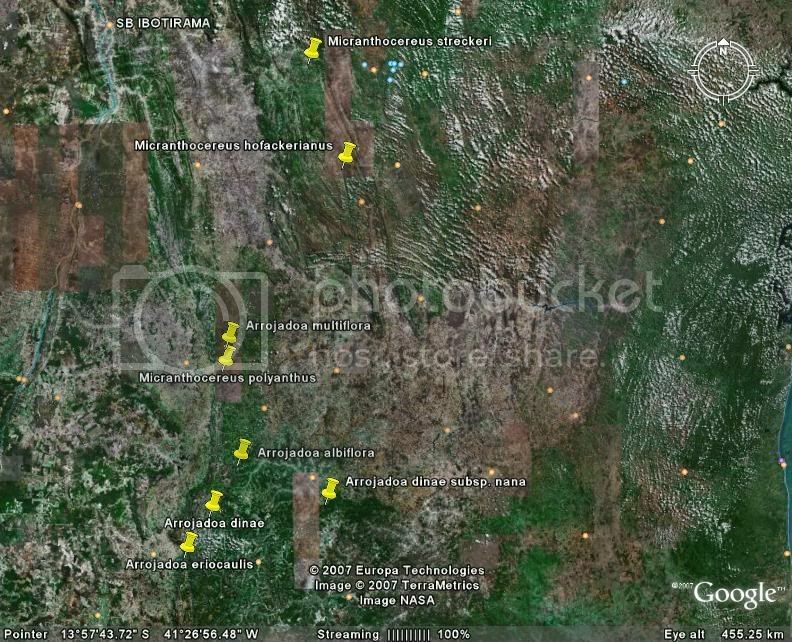 Photo: Google Earth. Micranthocereus hofackerianus in habitat. Photo: Marlon Machado. Ingo Horst collected material of this plant and gave it the field number HU 1394. Accompanying Ingo Horst in the trip in which the plant was found were Andreas Hofacker, Bernhard Bohle, Graham Charles and Konrad Herm. 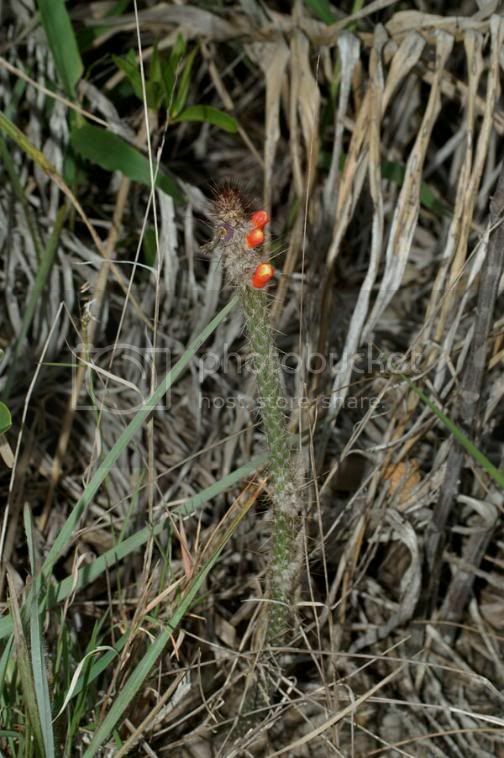 They all agreed that the plant was a species of Arrojadoa related to Arrojadoa dinae, because of the slim stems and bicolored orange and yellow tubular flowers, and the fact that the plant produced underground stem-tubers as many other plants of the Arrojadoa dinae group. However this plant was unusual in that it did not produce an apical cephalium like other Arrojadoa but instead it produced flowers down one side of the stem. 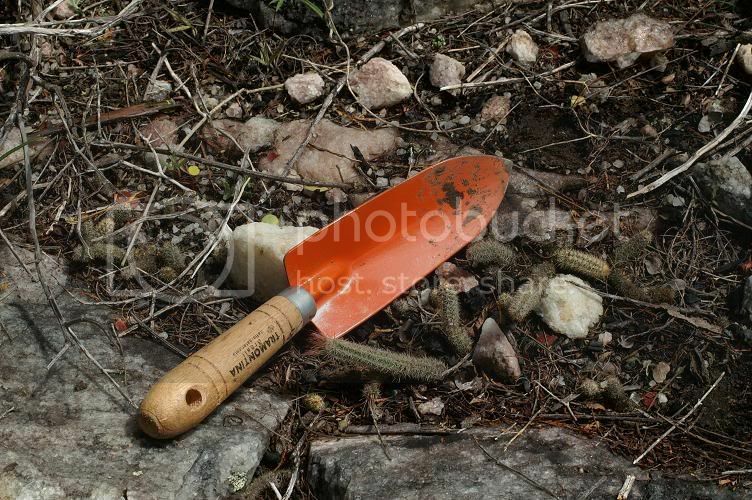 But other than that, it had the general morphology of plants of the Arrojadoa dinae group. Arrojadoa multiflora in habitat a few kilometers south of Caetit?, Bahia. Photo: Marlon Machado. In the original description of subsp. 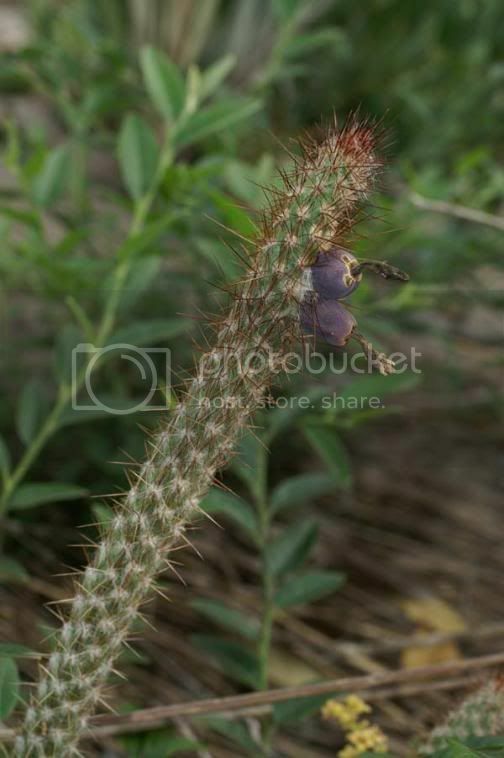 hofackeriana, Braun & Esteves stated that in vegetative condition its stems are hardly different from those of A. multiflora, although the spines and wool in the new subspecies are darker, more brownish in colour. According to Braun & Esteves, the key distinguishing features between this new plant and A. multiflora are differences in flower and fruit morphology. Arrojadoa multiflora in cultivation, showing flowers being produced outside the cephalium. Photo: Marlon Machado. Micranthocereus hofackerianus in flower. Photo: Marlon Machado. Flowers of Arrojadoa dinae being born on an apical cephalium. Photo: Marlon Machado. Fruits of Arrojadoa multiflora, produced in a cephalium at the apex of the stem. Photo: Marlon Machado. In cultivation A. multiflora may produce flowers without producing a cephalium, but this is probably a result of the more lush conditions of cultivation, and it has not been observed in nature. Hence, subsp. hofackeriana differs from other Arrojadoa taxa because the flowers are produced in a lateral position, rather than in an apical position. Another difference between subsp. 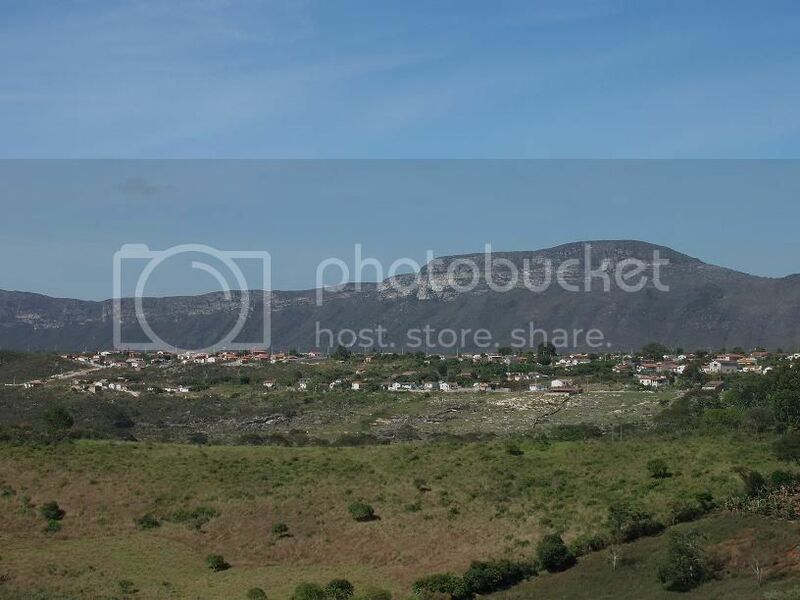 hofackeriana and A. multiflora that was not mentioned by Braun & Esteves is that subsp. hofackeriana develops underground stem-tubers, thus differing from A. multiflora which does not develop stem-tubers. 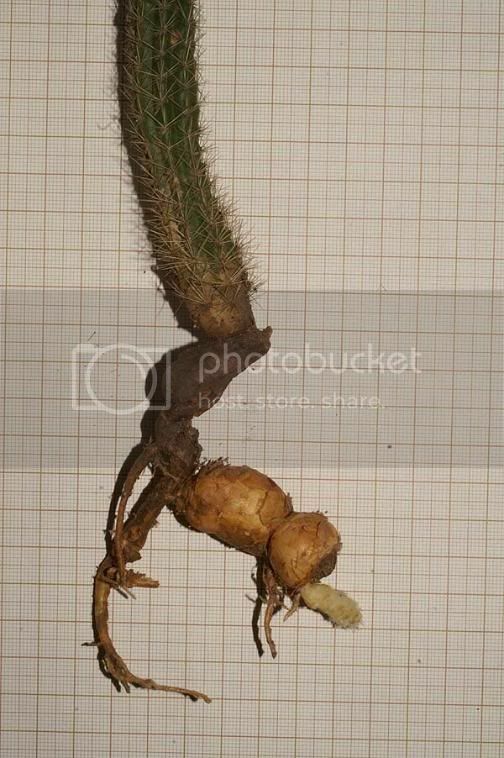 Underground stem-tubers of Micranthocereus hofackerianus. Photo: Marlon Machado. Underground stems of Arrojadoa multiflora. Photo: Marlon Machado. Close-up of stem-tuber of Micranthocereus hofackerianus, showing its areoles. Photo: Marlon Machado. 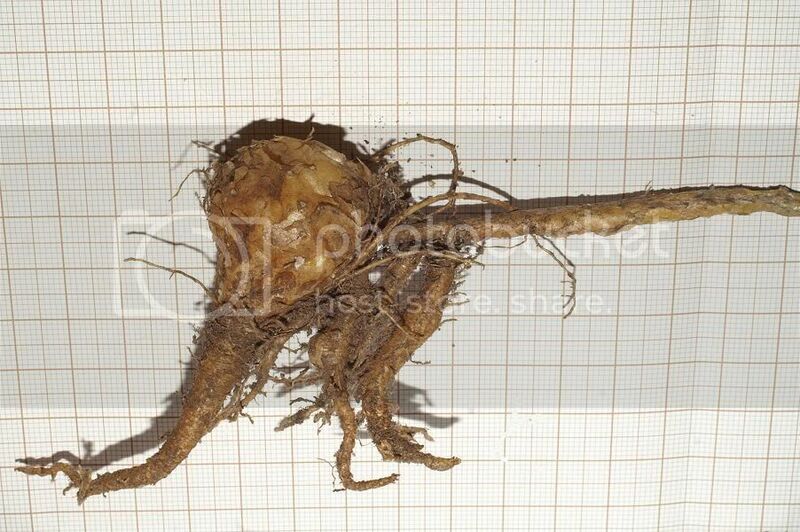 Underground stem-tuber of Arrojadoa eriocaulis. Photo: Marlon Machado. Underground stem-tubers of Arrojadoa dinae. Photo: Marlon Machado. New stem-tuber developing in Arrojadoa dinae. Photo: Marlon Machado. Comparison of stem-tubers of A - Arrojadoa eriocaulis, B - Arrojadoa dinae, and C - Micranthocereus hofackerianus. Drawing: Marlon Machado. 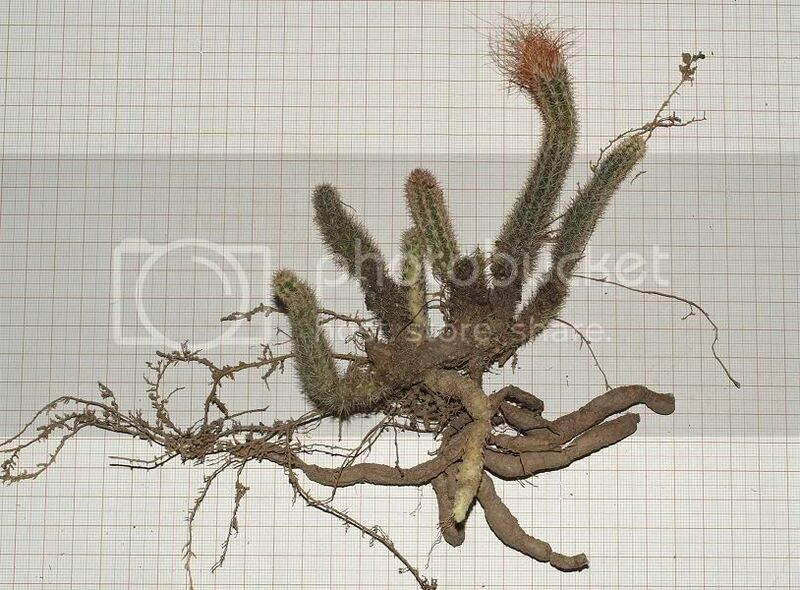 Tuberous adventitious roots in Micranthocereus hofackerianus. Photo: Marlon Machado. 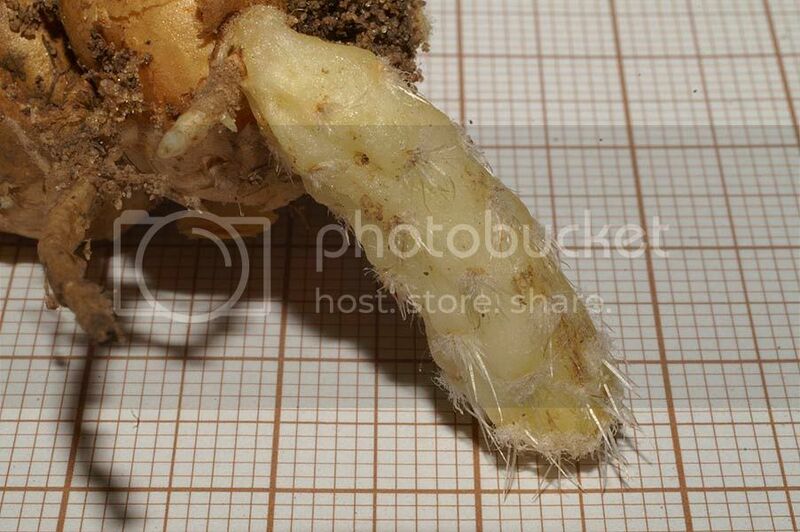 Lignified vascular cambium within the stem-tubers of Micranthocereus hofackerianus. Photo: Marlon Machado. Connected stem-tubers in Micranthocereus hofackerianus. Photo: Marlon Machado. This development of stem-tubers is quite unlike what happens in A. dinae and A. eriocaulis, where the stem-tubers are derived from individual stems. Arrojadoa multiflora subsp. hofackeriana has therefore a number of unique characteristics, for instance the flowers produced from the lateral of the stem and the different development of stem-tubers that distinguish it from A. multiflora, and also from other Arrojadoa species. Because of these distinct characteristics, it could even be recognized as a distinct species of Arrojadoa instead of a subspecies of A. multiflora. 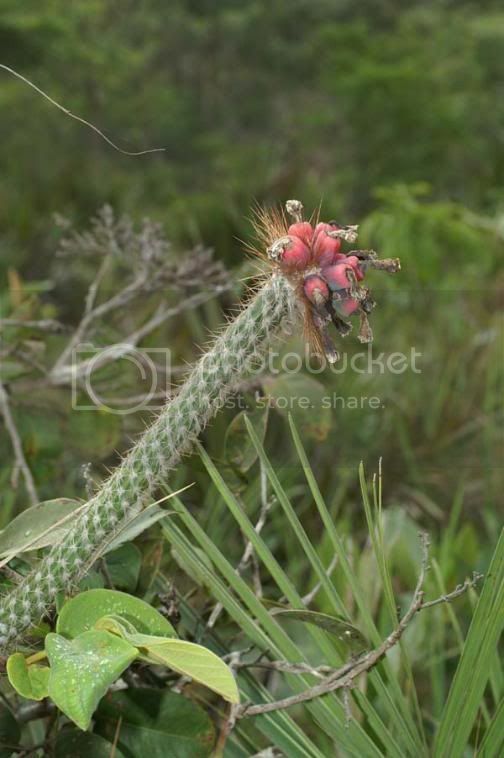 However, the distinctiveness of this plant was not recognized in the treatment of Arrojadoa in Taylor & Zappi's magnum opus, their book ?The Cacti of Eastern Brazil? (Taylor & Zappi, 2004). All the different plants related to Arrojadoa dinae - A. multiflora, A. eriocaulis, etc. are regarded as variations of A. dinae by Taylor & Zappi, with only A. eriocaulis recognized as a subspecies of A. dinae. Because of its stem-tubers, subsp. hofackeriana is placed in the synonym of subsp. eriocaulis, and the only mention to it is as follows: ?The form from Bahia requires further study, but does not seem to be specifically distinct as some commentators have suggested?. In Hunt's magnum opus, The New Cactus Lexicon (Hunt, 2006), Arrojadoa eriocaulis is recognized as a species distinct from A. dinae, but no other plants of this group are recognized as distinct, and like in Taylor & Zappi's treatment, A. multiflora and its subsp. hofackeriana are regarded as synonymous with these two accepted species. Micranthocereus flaviflorus photographed at Morro do Chap?u. Photo: Marlon Machado. However, A. multiflora subsp. hofackeriana has stems which are thinner than the stems of Micranthocereus species and more akin to the stems of Arrojadoa species of the A. dinae group, and besides subsp. hofackeriana produces stem-tubers, a feature not found in any Micranthocereus species but common in Arrojadoa species of the A. dinae group. Thus, A. multiflora subsp. hofackeriana possesses characteristics that suggest a relationship with either Arrojadoa or Micranthocereus - the thin stems and the production of stem-tubers points to a relationship with Arrojadoa, while the lateral production of flowers points to a relationship with Micranthocereus - plus some characteristics that are ambiguous, for instance the flower morphology that cannot be used to unequivocally assign this plant to either Arrojadoa or Micranthocereus, because flowers in these two genera have a very similar morphology. In cases like this, it is useful to investigate characters that are independent from morphology, such as anatomical, chemical or molecular characters, in order to assess the true relationships of the dubious taxon. I investigated the relationships among all the different groups of the tribe Cereeae, including in the study at least two distinct species of each genus and subgenus of the tribe, in order to prepare a phylogeny of the Cereeae - which is a genealogy, or family tree, of the different groups belonging to the tribe, telling which species and genera are more closely related to each other and how they all derived from their common ancestor. This phylogeny was prepared using sequences of DNA from four regions of the chloroplast genome. I included a sample of A. multiflora subsp. hofackeriana in this study, in order to find out to whom this plant was related. It turned out that A. multiflora subsp. 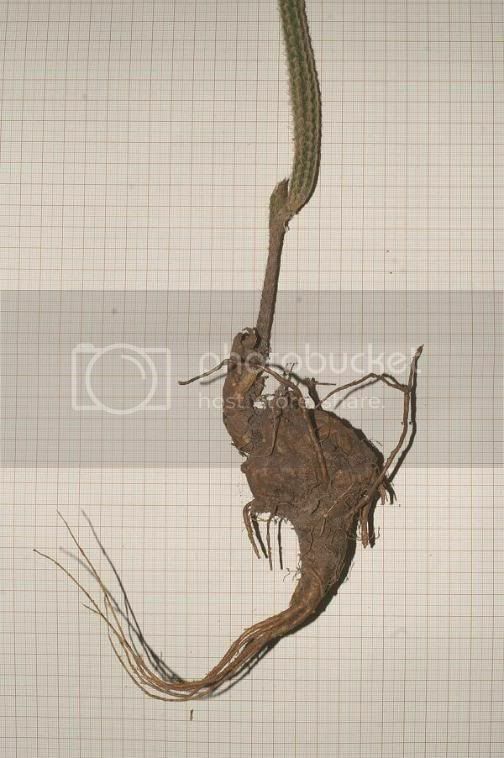 hofackeriana was not an Arrojadoa at all, but instead it belonged to Micranthocereus, being very closely related to M. polyanthus (Werdermann) Backeberg and M. streckeri van Heek & van Criekinge! And by the way, the phylogeny shows that Arrojadoa and Micranthocereus are not very closely related groups, what makes the placement of A. multiflora subsp. 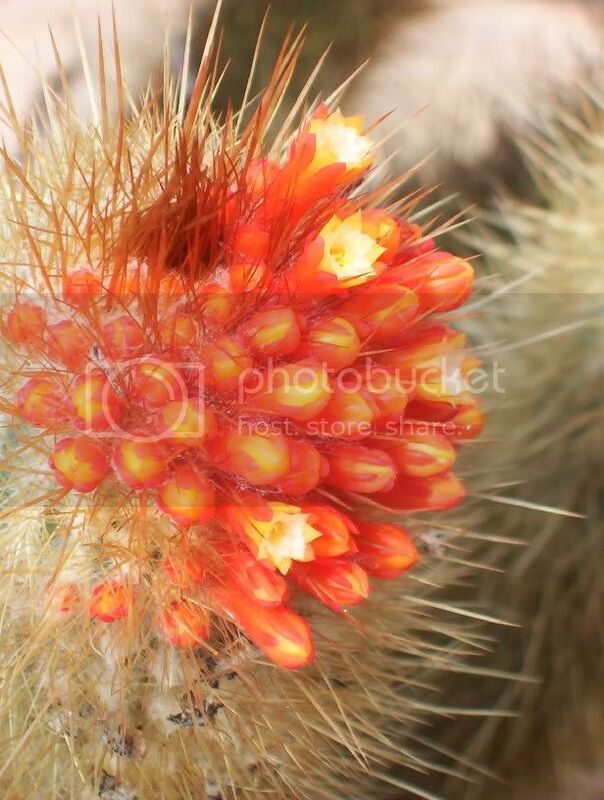 hofackeriana in Micranthocereus something even more incredible! In order to make sure these results were correct, I prepared new sequences of DNA for the sample of subsp. hofackeriana I had included in the study, and I also included another sample from a different individual. These steps were taken to exclude the possibility that the first sample was mixed up or contaminated with another sample when I was sequencing it. All the specimens sequenced gave the same result, thus demonstrating that Arrojadoa multiflora subsp. 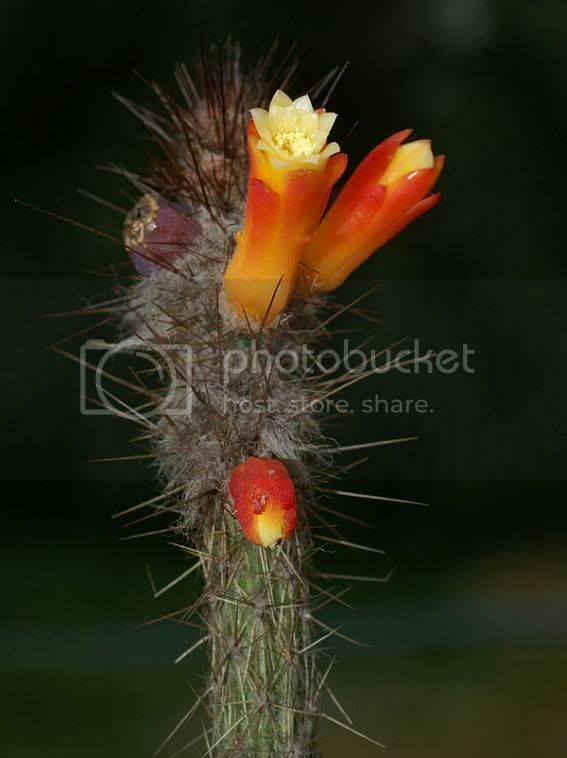 hofackeriana is descendent from a lineage within Micranthocereus, and it is not related to Arrojadoa. This result prompted me to transfer this plant to the genus Micranthocereus (Machado, 2006). 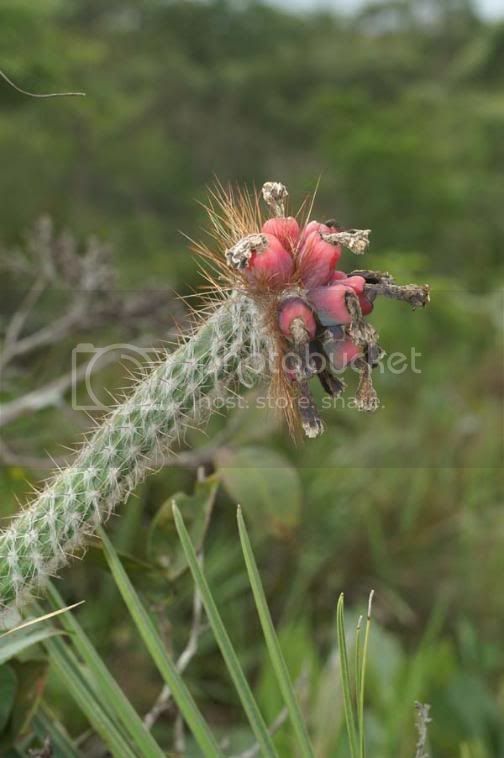 Young fruits of Micranthocereus hofackerianus, borne on one side of the stem. Photo: Marlon Machado. Ripe fruits of Micranthocereus hofackerianus. Photo: Marlon Machado. However, the overall morphology of Micranthocereus hofackerianus is so strongly similar to the morphology of an Arrojadoa from the A. dinae group that it raises the question, are these similarities merely the result of convergence, , that is, the characteristics that make these taxa similar evolved in parallel and are not good indicators of close relationships, or are these similarities an indication that M. hofackerianus is in fact a species of hybrid origin? Hybrids among species belonging to different genera are common in Cactaceae, with many such hybrids having been created in cultivation, and sometimes such hybrids are found in nature as well - for a review of this subject, see the article published in Bradleya by Gordon Rowley (1994). Unfortunately, the use of DNA sequences from the chloroplast genome to investigate the relationships of M. hofackerianus with other species of Cereeae cannot provide a definitive answer to the question ?is M. hofackerianus a species of hybrid origin? ?, because chloroplasts are usually inherited from the mother parent in most plant species, and thus if M. hofackerianus is indeed of hybrid origin, the fact that it possess chloroplast DNA similar to that of other Micranthocereus species, it only means that its mother parent must have been a Micranthocereus species. In this case, the Arrojadoa parent would have contributed the pollen to the cross that produced the first plants of M. hofackerianus, and would thus be the father parent of the cross. If M. hofackerianus is a hybrid, then its Arrojadoa parent would have conferred some of its characteristics to it, such as the thin stems and the production of stem-tubers. However, if M. hofackerianus is not a species of hybrid origin, then its stem-tubers and those of the Arrojadoa species from the A. dinae group must have evolved independently. The different development and anatomy of the stem-tubers in M. hofackerianus and the Arrojadoa species from the A. dinae group may support this idea. 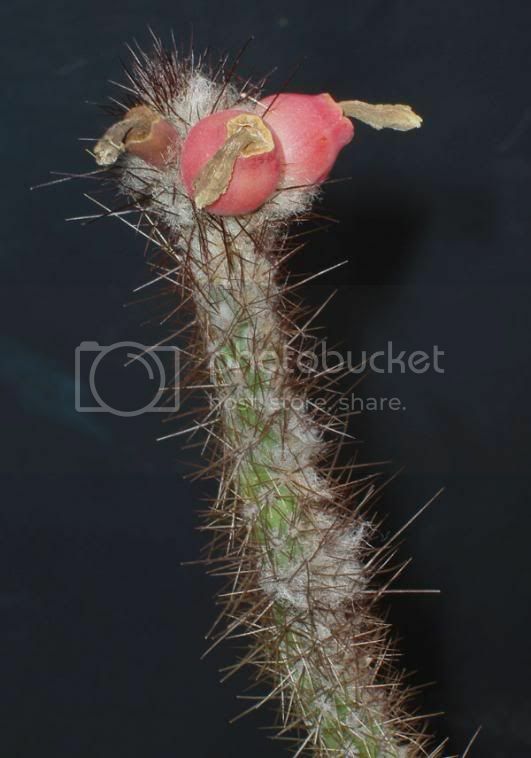 But one fact that argues against it is that no other Micranthocereus species develops stem-tubers. If otherwise M. hofackerianus is indeed a species of hybrid origin, then the different development of its stem-tubers could be explained as being the result of the interplay between the genes of its Arrojadoa and Micranthocereus parents, leading to a unique way of developing stem-tubers in M. hofackerianus. If Micranthocereus hofackerianus is a hybrid between a species of Arrojadoa closely related to A. dinae and a species of Micranthocereus, it is most probably an ancient hybrid, because nowadays in the area where M. hofackerianus grows, there are no known populations of neither an Arrojadoa species from the A. dinae group nor populations of any other Micranthocereus species of subgenus Micranthocereus. 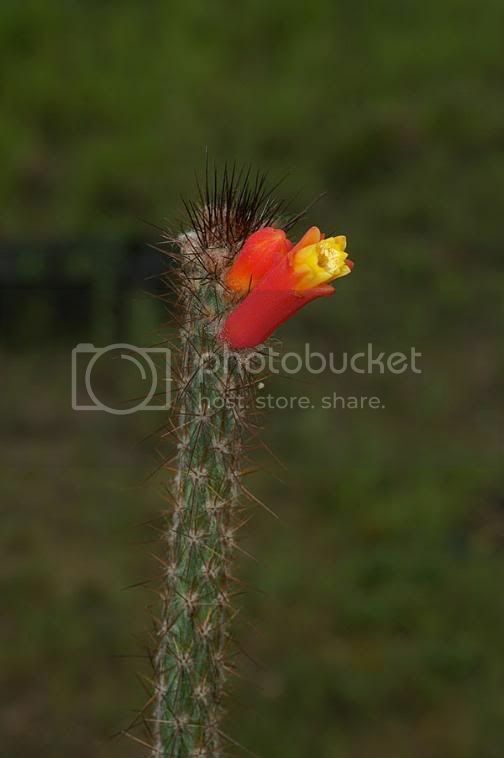 But perhaps they existed in the past, and the hybridization of an Arrojadoa species from the A. dinae group with a species of Micranthocereus subgen. Micranthocereus resulted in M. hofackerianus. It must be pointed out however that the type species of Micranthocereus subgen. 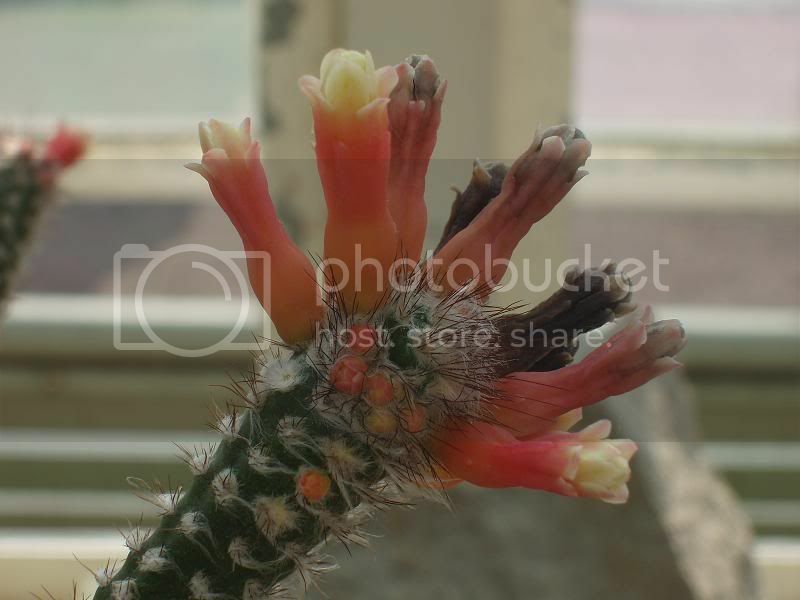 Micranthocereus, M. polyanthus, grows in some places together with Arrojadoa multiflora, a species from the A. dinae group, and no hybrids have ever been found between these two species. This is not to say that such hybrids cannot be formed, but that if M. hofackerianus is of hybrid origin, then it was the result of a very rare event indeed. Locations of M. hofackerianus, M. polyanthus, M. streckeri, A. dinae, A. eriocaulis and A. multiflora. 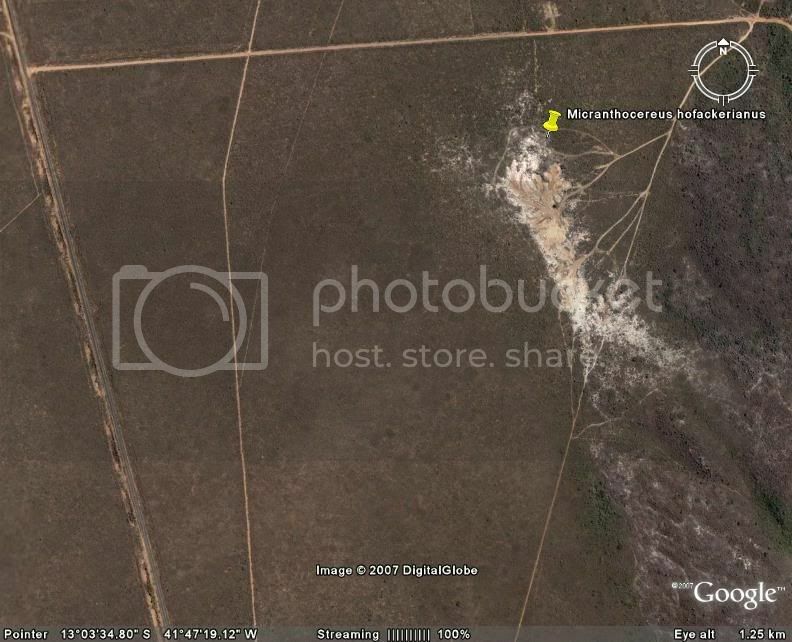 Photo: Google Earth. There is no question however that M. hofackerianus is a good species, because it occurs as a morphologically very uniform population consisting of hundreds of individuals. Obviously the hybrid origin of Micranthocereus hofackerianus is at present no more than a hypothesis. The morphological similarity between this species and the Arrojadoa species from the A. dinae group, although striking, may be as well the result of convergence. 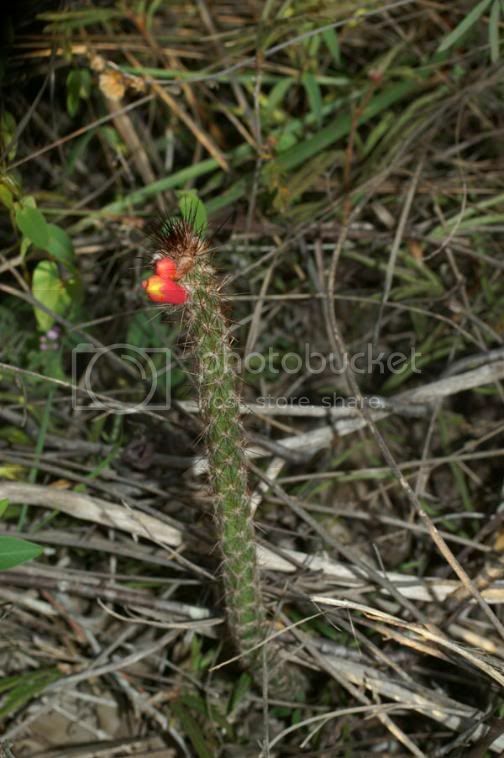 The Arrojadoa species from the A. dinae group are unique amongst the cacti of eastern Brazil in their possession of well-developed true tubers (Taylor & Zappi, 2004). Micranthocereus hofackerianus possess similar, though seemingly distinct, tubers (Machado, 2006). 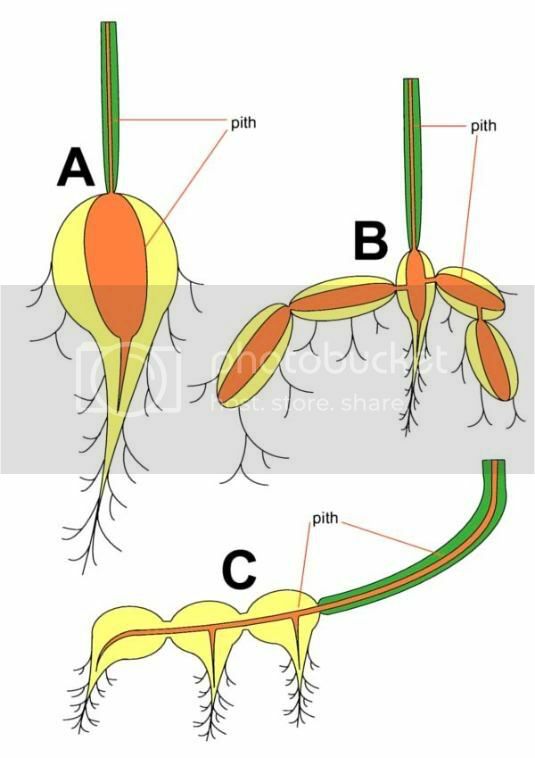 Anatomical investigation of the structure and development of the tubers in these species may reveal if their similarities are a result of common origin or the result of convergence. Also, the investigation of DNA sequences from nuclear genes may also help to elucidate this question. 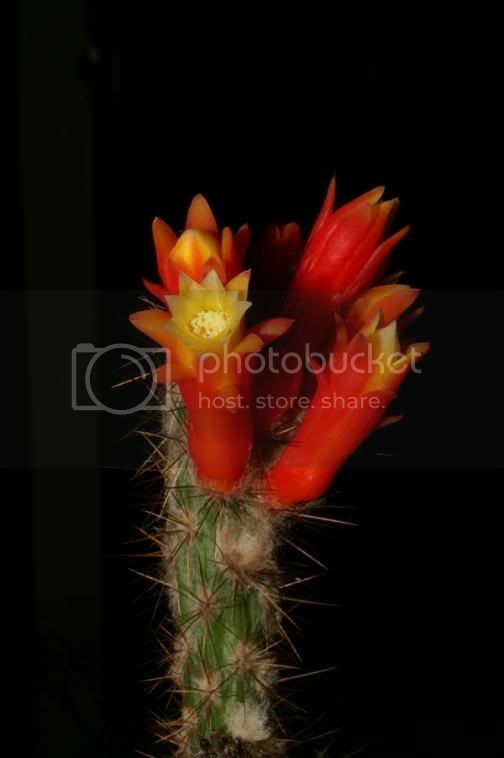 Regardless of the question of it being a species of hybrid origin or not, Micranthocereus hofackerianus is a wonderful new species, which sadly is already endangered in habitat: the sand quarry at the place where this species occurs is increasing all the time, and plants of Micranthocereus hofackerianus are being destroyed. It is to be hoped that more populations of this species occur in other habitats, and that these populations are undisturbed. It would be a tragedy to witness this unique species being extinct in nature. Braun, P.J. & Esteves Pereira, E. 2002. 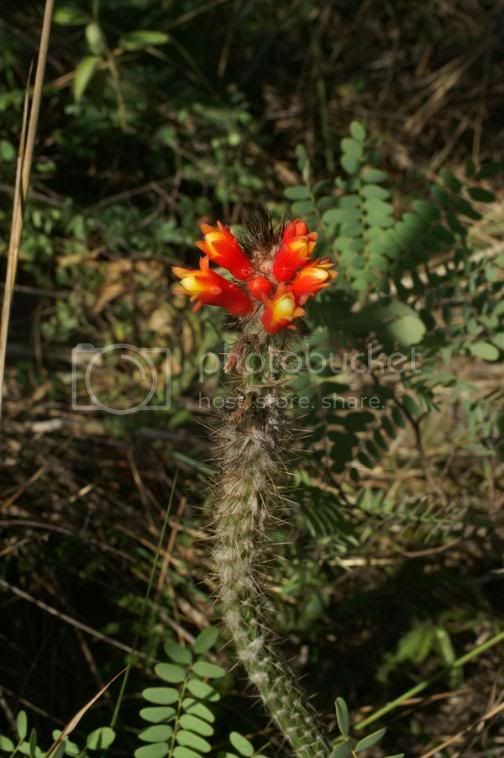 Eine neue Unterart aus Bahia, Brasilien: Arrojadoa multiflora subsp. hofackeriana P.J.Braun & Esteves. Kakteen und andere Sukkulenten 53: 71-75. Hunt, D. R. (ed.) 2006. The New Cactus Lexicon. Description & illustrations of the cactus family. DH Books: Milborn Port, England. Machado, M.C. 2006. 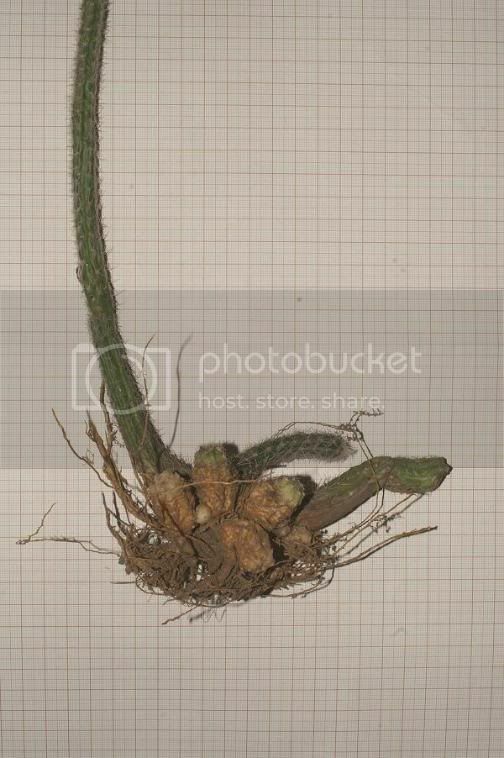 Micranthocereus hofackerianus (Cactaceae) - eine neue Kombination f?r ein bemerkenswertes Taxon. Kakteen und andere Sukkulenten 57: 267-273. Rowley, G.D. 1994. Spontaneous bigeneric hybrids in Cactaceae. Bradleya 12: 2-7. Taylor, N.P. & Zappi, D.C. 2004. 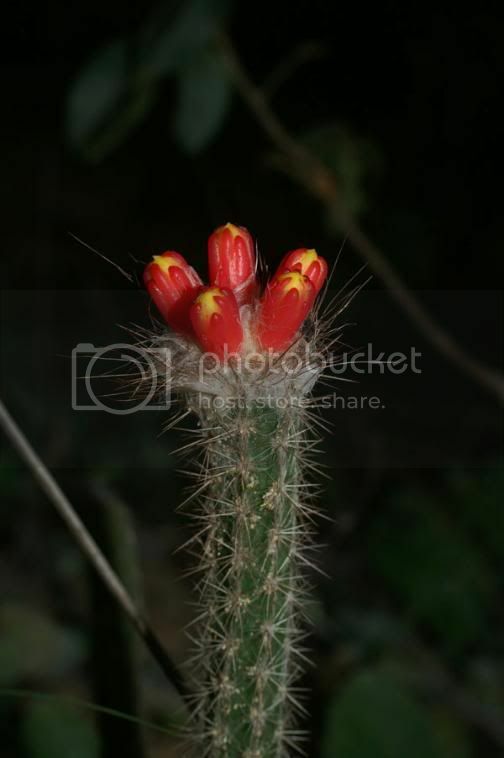 Cacti of eastern Brazil. Kew: Royal Botanic Gardens, Kew. This article will go to the journal, I just decided to make it available online as well - consider this post as a preview of the article which will grace the pages of the journal in the near future. Fascinating, I don't really know much about either of these genera. 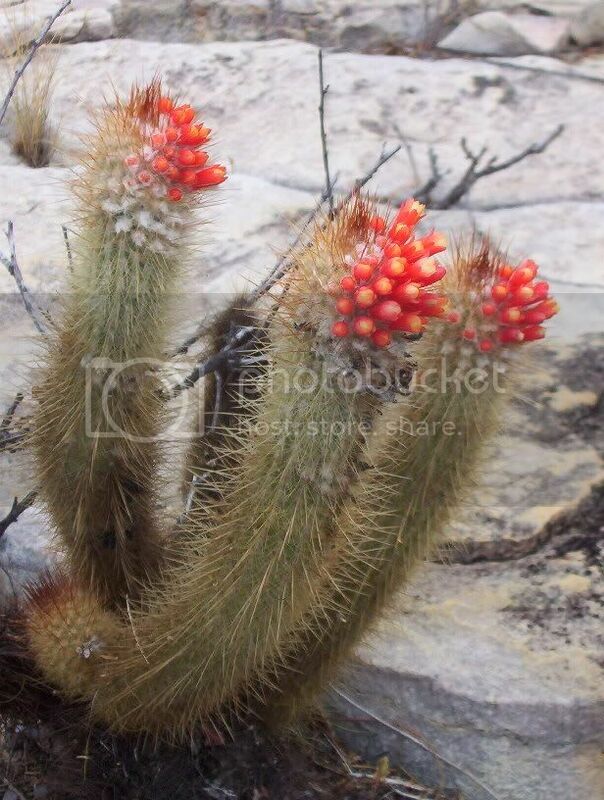 But is Micranchocereus = Micranthocereus? Thanks for pointing out to me the misspelling of Micranthocereus in the text, which I have now corrected. It was the damn autocorrect function of OpenOffice Writer, it memorizes a word and changes it to the version it has stored in its list whenever I type it. If the word was misspelled the first time I used it, then that is the end - the program will always use that version of the word, unless I clear its "memory". 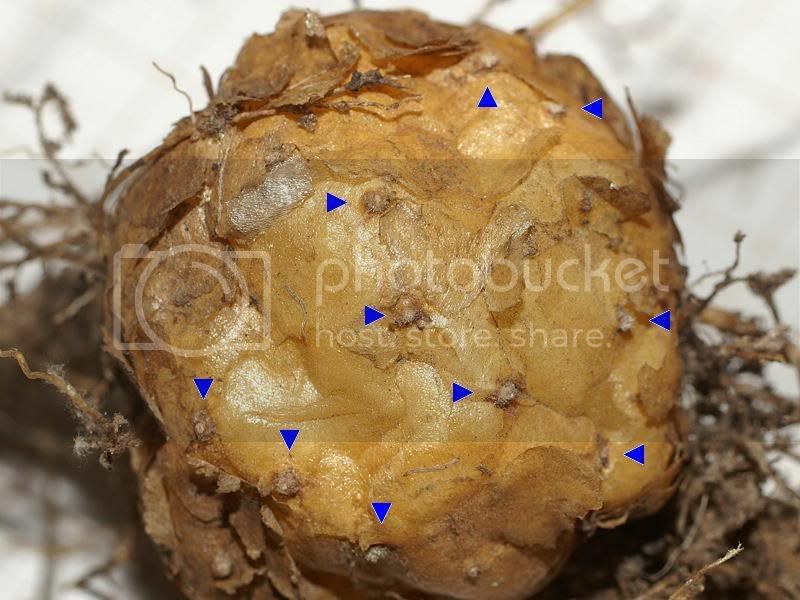 Some of the tuberous roots with areoles look very similar to stoloniferous growths, have they simply evolved from stolons or do they produce new stems further from the main stem in these species? A fascinating and well illustrated article. Thanks for the preview, I'll look forward to reading more! 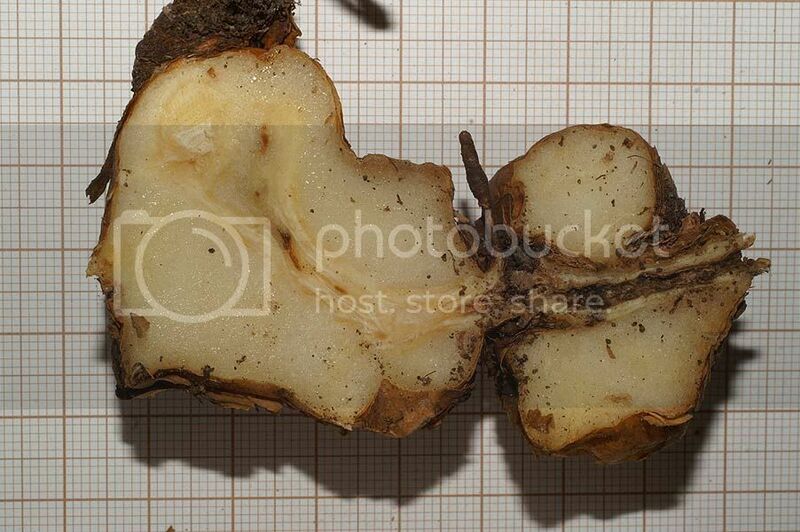 I believe that these tubers did not evolve from stolons, because they are formed on the main stem of these species already from the seedling stage. 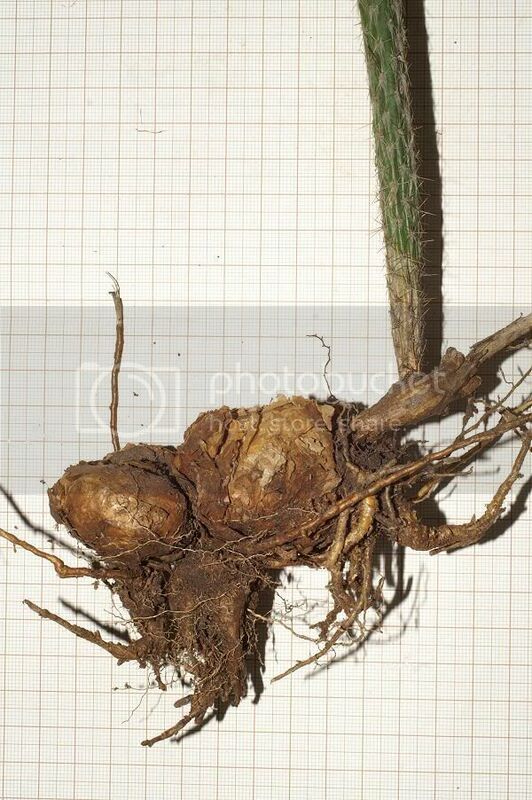 However, in some of these Arrojadoa species the stem develop underground but do not transform into tubers, and could be considered as stolons or perhaps they are "reserve" stems, to grow on in case the main stem above the ground is lost, for example because of a fire. But at least one population of A. dinae have stems that could be regarded as stolons: it is a population of the form described by Braun & Esteves as A. dinae subsp. nana. 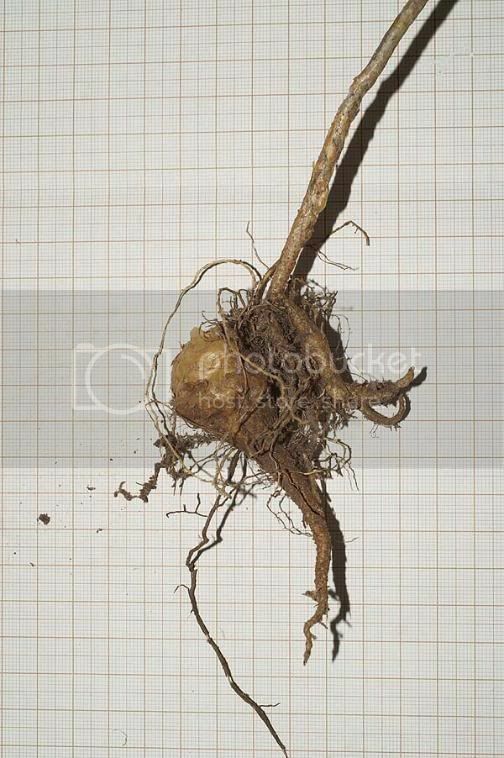 Plants at this population do not develop tubers, but have stems that runs underground and emerge some distance away from the original plant, rooting along the way and in time producing another individual. Arrojadoa dinae subsp. nana in habitat, near Cordeiros, Bahia. Photo: Marlon Machado. Arrojadoa dinae subsp. nana. Photo: Marlon Machado. Thank you Marlon for an excellent article that is not only highly informative but easily readable too.